Labour and Tory MPs have been locked in discussions since last week in an effort to find a way through the current impasse. Jeremy Corbyn’s spokesman yesterday said the two sides were still “a long way” apart. He said: “We’ve yet to see clear evidence of the kind of real change and compromise that would obviously be necessary to reach an agreement on that kind of alternative. 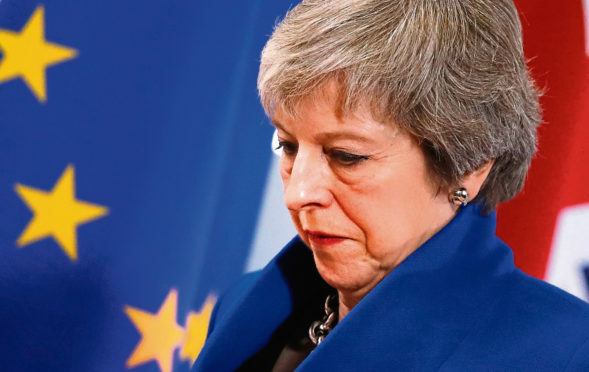 “The government side has been engaged in the detail explaining its position and the details of how it sees its own deal which of course has been rejected in one form or another three times in parliament. Despite the disagreement, the spokesman said both sides remained “seriously engaged” on finding a deal. Theresa May’s spokesman echoed the sentiment, telling reporters that the negotiating teams had a “shared determination to see what can be done”. SNP Westminster leader Ian Blackford slammed the “backroom” talks at prime minister’s questions yesterday however. He said: “People can’t have faith in a backroom deal cooked up by two leaders who don’t possess the ingredients to hold their parties together, never mind hold these islands together. Speaking after the question session Mr Blackford added: “Jeremy Corbyn needs to come clean with the public on what exactly he is bargaining with the Tories, behind closed doors. People deserve to know the truth.